SEOUL, South Korea North Korea's leader said Friday that his rocket forces were ready "to settle accounts with the U.S.," an escalation of the country's bellicose rhetoric and a direct response to the unprecedented announcement that U.S. nuclear-capable B-2 bombers had joined military drills with South Korea. Kim Jong Un's comments in a meeting with his senior generals were part of a rising tide of threats meant to highlight anger over the military drills and recent U.N. sanctions over Pyongyang's nuclear test. North Korea sees U.S. nuclear firepower as a direct threat to its existence and claims the annual military drills are a preparation for invasion. Pyongyang also uses the U.S. nuclear arsenal as a justification for its own push for nuclear-tipped missiles that can strike the United States  a goal that experts believe to be years away, despite a nuclear test last month and a long-range rocket launch in December. South Korea's Yonhap news agency quoted military officials in the country as saying there had been "increased activity" at some of the North's missile sites in recent days. "North Korea's launch sites to fire off mid- and long-range missiles have recently shown increased movement of vehicles and forces," Yonhap quoted one anonymous official as saying. "We are closely watching possibilities of missile launches." U.S. officials have not made any corroborating claims this week of increased suspicious activity in North Korea. A full-blown North Korean attack is deemed unlikely, though there are fears of a more localized conflict, such as a naval skirmish in disputed Yellow Sea waters. Such naval clashes have happened three times since 1999. North Korea's threats are seen by outside analysts as efforts to provoke South Korea to soften its policies and to win direct talks with Washington that could result in aid. Kim's comments are also seen as ways to build domestic loyalty and strengthen his military credentials. Kim met early Friday morning with his senior generals, state media reported, signed a rocket preparation plan and ordered his forces on standby to strike the U.S. mainland, South Korea, Guam and Hawaii. Many analysts say they've seen no evidence that Pyongyang's missiles can hit the U.S. mainland. But it has capable short- and mid-range missiles, and Seoul is only a short drive from the heavily armed border separating the Koreas. U.S. 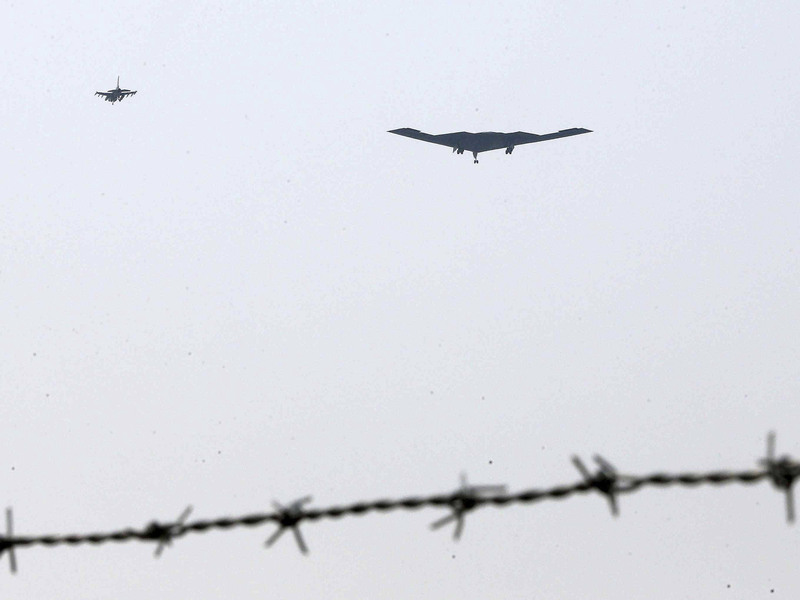 Forces Korea said Thursday that the B-2 stealth bombers flew from a U.S. air base in Missouri and dropped dummy munitions on the South Korean island range before returning home. It was unclear whether America's stealth bombers were used in past annual drills with South Korea, but this is the first time the military has announced their use. The statement follows an earlier U.S. announcement that nuclear-capable B-52 bombers participated in the joint military drills. Earlier, Defense Secretary Chuck Hagel said the addition of nuclear-capable B-2 stealth bombers to military drills with South Korea was part of normal exercises and not intended to provoke a reaction from the north. Hagel said Thursday that North Korea's belligerent tones and actions in recent weeks have "ratcheted up the danger" in the region. He said the United States has to be prepared to defend its interests as well as the interests of its allies. The defense secretary said there are a lot of "unknowns" with North Korea. U.S. Forces Korea said in a statement Thursday that two B-2 stealth bombers flew from an air base in Missouri and dropped dummy munitions on the South Korean island range before returning home. A Pentagon official told CBS News that, since March 8, the U.S. military has flown more traditional looking, non-stealth B-52 bombers over South Korea three times, but Thursday was the first run over the peninsula by B-2s. At a Thursday afternoon press conference at the Pentagon, Hagel said the "North Koreans have to understand that what they're doing is very dangerous." "They have some options," Hagel said. "They can take another approach to a better future, but what they're doing now is not the way to do that." Hagel, who was joined at the briefing by Joint Chiefs Chairman Gen. Martin Dempsey, defended carrying out the stealth bombing runs to South Korea. "I don't think we're poking back or responding," he said. "I don't think we're doing anything extraordinary or provocative or out of the -- out of the orbit of what nations do to protect their own interests and assure ... not only to our South Korean ally, but to our other allies in the region, that we must make clear that these provocations by the North are taken by us very seriously and we'll respond to that." Hagel also defended the U.S. military's decision to beef up missile defense in Alaska and California in light of Pyongyang's recent provocations - even if North Korea doesn't currently have the capability of striking the U.S.
CBS News correspondent Major Garrett notes that it's not unusual for North Korea to threaten war when the U.S. and South Korea carry out joint training exercises, but the White House views Kim as an unpredictable figure. "We don't have any choice in defending this country but to anticipate worst case scenarios," Hagel said. "These are decision-making processes that evolve based on threats -- you only need to be wrong once." One sign this could all be North Korean bluster, Garrett reports, is that North Korea has kept open a key industrial park where hundreds of South Koreans do business every day and where global trade produces roughly $2 billion for the isolated nuclear power. White House officials tell CBS News they've stepped up communication with South Korea as well as new governments in Japan and China, looking for allies throughout the region to tell the North it's playing a perilous game.